[Singapore] DAYS of heady growth in the private residential market may now be a thing of the past, but longer-term growth prospects appear to remain healthy and are in fact moving on a more sustainable trajectory. Analysts believe that there remains ample demand in the longer-term for private properties, even as the market continues to come to grips with a slew of measures put in place since 2009, and as macro-economic uncertainty continues to lurk in the background. Even in the shorter-term, both buyers and sellers are not expected to take a big hit, even if expectations have to be tempered somewhat. “I’m expecting stable markets, no rude shocks, (it’s) unlikely we’ll see (a) steep rise in prices; neither do we see any sudden drop in values,” said Donald Han, managing director at Chesterton Singapore. There have already been seven rounds of cooling measures over the past four years, as well as other significant property measures in the meantime. Just last month, the government announced a package of public housing measures, including a lower Mortgage Servicing Ratio (MSR) and shorter loan tenure for Housing and Development Board (HDB) housing loans; and a three-year wait for Permanent Residents (PRs) before they can go for resale HDB flats. Earlier in June, the Monetary Authority of Singapore (MAS) implemented a Total Debt Servicing Ratio (TDSR) framework on all property loans from financial institutions to encourage greater financial prudence. Specifically, it mandated that all property loans have to stay within a threshold of 60 per cent of all monthly debt obligations to monthly gross income. It also fixed interest rates for property loans at 3.5 per cent and 4.5 per cent depending on asset type, or the prevailing market interest rate, whichever is higher. Even though the MAS has said that the TDSR was not targeted at the current property cycle, its enforcement was singled out as a reason for a drastic fall in new private residential sales in July. Excluding ECs, developers sold 481 private homes, less than a third of the 1,806 units moved in June. The number of homes launched also plunged to 557 homes, from 1,768 units in June. But it is typical for both buyers to hold back on purchases and developers to hold back on launches after each significant change in regulations, and analysts expect a rebound in sales from September as the various parties adjust to the new measures and as the bad-for-business lunar Ghost Month passes. That said, consultants view the TDSR as a game-changer. Knight Frank chairman Tan Tiong Cheng said in a recent report that the TDSR has had the greatest impact of all the cooling measures in the past four years. Analysts generally felt it helped to close a loop in terms of exuberant demand, as it forced potential buyers to be rational with their decisions, as the amount they can borrow is tied to all outstanding debt and there is no way around this limit. Mr Han from Chesterton noted that earlier rounds of cooling measures tended to focus solely on the real estate sector, whereas current rules are more rounded and broad-based in targeting financial prudence. then try to justify it logically”, which can no longer be the case. He suggests that if a buyer plans to enter the market right now, he or she should go to the bank and work out all the finances before embarking on a purchase, if at least to make sure everything is in order. By fixing the interest rate on property loans higher than they are currently, Chesterton’s Mr Han believes the TDSR framework also protects against future higher interest rates stemming from a potential pullback in quantitative easing by the US and macro-economic uncertainties, barring any unforeseen shocks. There has of course also been concern over the TDSR, which has lowered the budget for some home seekers. With land prices rising steadily over the last three years, there are worries that future private residential property projects will be priced out of reach for the average buyer, SLP International said in a report shared with The Business Times. “This could result in a double whammy for some homebuyers.” But the property consultancy also said there are still bargains on the primary market for private residences. Market watchers are generally citing the magic number for affordability at around the $1 million mark. In most cases, it just means buyers go for what they can afford, rather than what they want. “Say you are looking out for three-room (homes), now you got to go for two-room, if you are looking for two, now you might have to go for your one-room. If you are looking for freehold you might have to go for leasehold property. If you’re looking for brand new, now you might have to go for older developments,” said Mr Han from Chesterton. The resale market could also turn up some choice options.SLP said that information provided by the Urban Redevelopment Authority (URA) showed that there have been several fairly large two-bedroom units that have sold for under $1 million. But of note is that resale units available in this price range since the start of the year have tended to be from projects which have had a good number of years checked off their 99-year leasehold tenures. Based on its own transaction data, ERA said that the percentage of transactions for resale private non-landed homes within the $800,000 to $1 million range has increased from 10 per cent in July to 15 per cent in August. A slightly more left-field option would be to go for Housing and Urban Development Company (HUDC) flats, some of which are available around that $1 million resistance point. While they are often older they are generally also more spacious than current offerings, SLP said. A narrowing gap between prices of condos in the Outside Central Region (OCR) and from the Rest of Central Region (RCR) also means that city-fringe homes may offer greater intrinsic value in the form of capital appreciation over the longer run. From the sellers’ point of view, they can expect more haggling from prospective purchasers. “Last time sellers would price (at) what they call the future price; they want to build in the profits you see; but I think now you have to be realistic,” said ERA’s Mr Lim. That said, he believes that sellers are not going to lose out as the market is still at its highest point. An increasingly stable market and the effectiveness of property measures also does not mean that private property prices will come crashing. Chestern’s Mr Han sees a downside of at most one to 3 per cent over the next 12 months for prices of private non-landed homes, and that transaction volumes may come down, especially for OCR projects. This is because as the resale HDB market starts to soften, the pool of upgraders who had benefited from a surge in resale flat prices of recent years will be diminished. 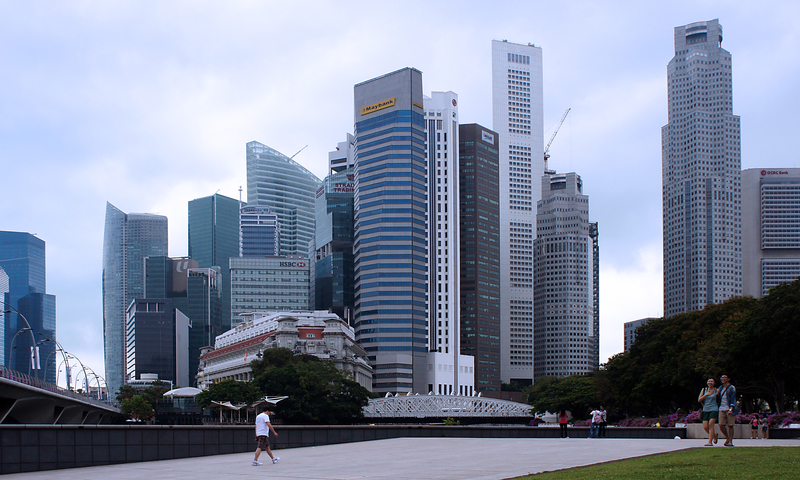 The latest flash data from the Singapore Real Estate Exchange (SRX) in August showed that the median cash-over-valuation (COV) has hit a four-year low at $18,000. It was at $35,000 in January. But the market remains flush with liquidity, with interest rates still low, resulting in what Ong Kah Seng, director of R’ST Research, termed recently as “latent demand” that will continue to hold up the market. ERA’s Mr Lim added that population growth should keep pace with future supply. He also sees added impetus for PRs to turn to lower-priced private properties around the million-dollar mark, due to the restriction on resale HDB flat purchases. Around 12,000 to 15,000 new PRs out of around 30,000 yearly could be potential buyers, he said. Whatever the case, most consultants share the view that the speculative sting has been taken out of the private residential market. Quick deals, quick profits and heavy pressure on buyers to buy before prices go up even further may be a thing of the past. Instead of looking at short-term gains, ERA’s Mr Lim believes there is likely to be a mindset change to longer-term capital appreciation. In the meantime, developers are taking action to help themselves. Some have offered discounts or are pricing lower than they initially would, not so much as a result of poor demand but to entice buyers to commit. “To expect developers who have got very strong balance sheets to go on double-digit discount is not going to happen,” said Mr Han, who sees discounts of at most 2-3 per cent. Due to rising land prices, consultants also expect developers could focus more on the design of new projects, with smaller units and better usage of space. This is to boost the absolute quantum to be had, since smaller units fetch a higher per square foot (psf) price compared with bigger ones within the same development. DTZ said in a recent report based on its caveats analysis that the proportion of purchases below $1 million rose significantly in the second quarter of this year, chiefly on the back of higher sales of shoebox apartments in OCR. Media attention has recently also turned to rental guarantees made by some developers for their retail developments, and some analysts see a chance of a return of such guarantees for residential projects, which has happened in the past. With all that is said, the idea of investing in property remains entrenched in the Singaporean frame of mind, and whatever changes lie afoot, that is not likely to change. “At the end of the day, if you say should I spend my money on buying a car or should I spend my money on buying a property I think it still makes sense to buy a property because a car is a depreciating asset from day one,” said Mr Lim from ERA. “People are generally still excited about the market,” he said. “The desire is still there because if you hold property, over time you will still make money,” he added.